In a bowl, add in the brown sugar, cinnamon, and cornstarch. Stir until combined. Add the diced apples, butter, and brown sugar mixture into a saucepan. Stir until all of the apples are coated. Place over medium heat and stir often. Let it cook until the juice from the apples and sugar thickens. Mine took five minutes to thicken. Scoop until a bowl and let cool. Work on cookie cups. In a mixing bowl, add in the butter and peanut butter, Mix until combined. Add in the brown sugar and granulated sugar. Mix until combined. Scrape down the sides. Add in the egg and vanilla extract. Mix until the egg is incorporated. Scrape down the sides of the dish. Add in the flour, baking soda and salt. Mix until the flour is incorporated. Scoop the cookie dough into a non-stick cupcake pan. My scoop was an ice cream scoop and filled the tins ¾ full. Place into the oven and bake for 18 - 20 minutes. 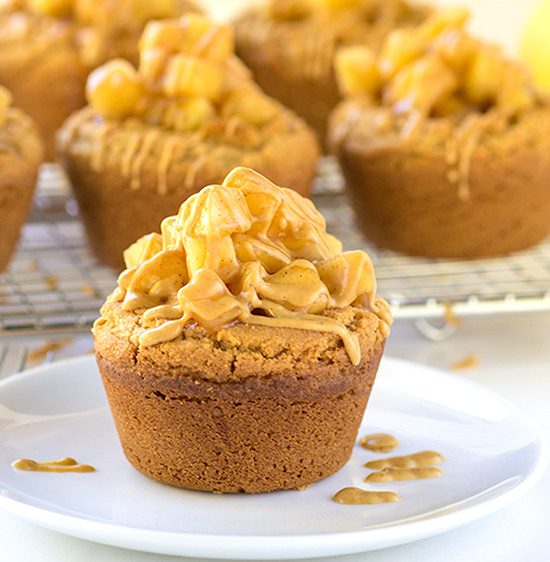 Remove from the oven and immediately press the center down to form a cup while they're still in the cupcake pan. I used a medicine cup for the center of my cookie cups and wiggled it around. Let the cookies cool for 15 minutes inside the cupcake pans. Turn the cupcake pan over onto the counter and give it a tap. They should come out. Place them on a cooling rack to finish cooling. Once cooled, fill with apple pie filling. Place the 1 tablespoon of peanut butter into a sandwich bag. Microwave for 30 seconds until slightly runny. Cut a small hole into the corner of a bag and drizzle over top of the cookie cups. 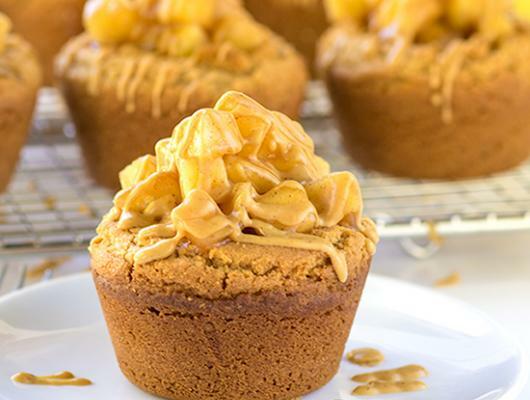 Apple Pie Peanut Butter Cookie Cups - peanut butter cookies baked inside cupcake tins and then stuffed with apple pie filling!